The overall analysis on the use of PharMeDoc Total Body Pillow for mothers-to-be is quite satisfactory if not totally perfect. This pregnancy pillow has lot of promises to be fulfilled, wait till you actually experience its wonders. An every night’s worthy sleep is not impossible after all. Comparing this type of pillow from the standard one is simply ridiculous. This J-shaped pillow is a brilliant solution to problem sleepers, especially those who are suffering aches and body pains all over their body. Priced affordably, the minuscule issues are simply overshadowed by its usefulness. As our title implies, this product is a pregnancy pillow that serves well women on the family way and after giving birth. Nursing moms need delicate pillow to be able to have a good night sleep, as well as their babies. Lactating mothers must have all the energy and proper care to be able to sleep comfortably while nursing their infants because quality time while awake is what they need. His quality time could only be achieved if they have a sound sleep the night before. Given the task of caring for their new-born, mothers are required to spend the night in thorough relaxation. Cushioning the whole body in one piece is not the job for conventional pillows because they lack the capability to cover or wrap-around the entire body. With the PharMeDoc Total Body Pillow, one pillow is just enough to protect and console mother and child. To better understand this product, its various worthwhile features are written below where you could assess its functionality and many uses, check these out! This body pillow is made from soft polyester which is totally chemical free. It is certified not to contain lead, Phthalate, latex and BPAs. These are toxic chemicals commonly associated with the manufacture of polyester, but PharMeDoc does not use these types a long time ago. Since pregnant women tend to increase their weight overtime, it is not a problem for this pillow because it is designed to absorb greater weight and area associated with pregnancy. By the way, the use of this pillow is not limited to pregnant women anyway, anyone who wants to achieve deep sleep as comfortable as they like can use this pillow. J-shaped pillow is really a brilliant idea. The manufacturer designed this pillow similar to the letter J to give sleepers many options of cradling one to the fullest. The shape of the pillow follows the body’s contour while lying in bed making the neck, back, hips and even knees are fully supported by the soft texture of its material. Whether you hug or cradle the pillow, it gives cooling effect so comfortable it relieves various aches associated with pregnancy or aging. This body pillow is truly ideal for pregnant moms on whom it provides adequate cushion that lets you sleep easily and comfortably without the hassle of sore neck, swollen waist and aching tummy. You can be assured of total relaxation when you are on the family way even on nights when your baby kicks inside your tummy. The unique J-shape design of the PharMeDoc Total Body Pillow enables you to have complete body coverage, literally from head to toe. While your shoulder is also relaxed when you lay down your whole body on this pillow, your spinal column also relaxes and relieved of pain and stress. The hips are also well protected snuggling the pillow. The legs, thighs and joints in feet could also experience the needed rest and feel the sensation of soothing from the pillow’s touching your skin. The package contains zippered cover that is made from cotton fabric. The zipper does not make a noise when unzipping because it is made in durable plastic and the fabric is machine washable. The seam is practically done well and almost seamless. Also Ideal as After-birth Pillow: Caring for your mind and body after you gave birth to a healthy baby; the pillow is still advisable for continued use. The stress and energy loss during child-bearing could be regained through perpetual good night sleep using this body pillow. 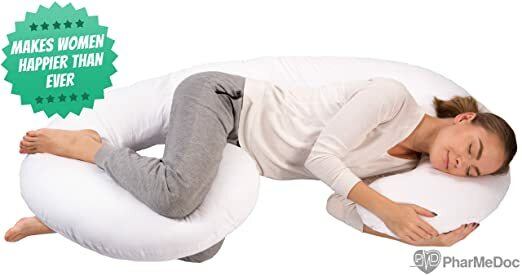 Also Ideal for Non-pregnant Women: Non-pregnant women or anybody else could utilize this pillow to give them the same effect as those who are pregnant. The ergonomic design of this product makes it more conducive to any person wishing not to have nightmares. Fits for Men and Women with Big Frame: Tall and large size men and women could easily fit with this pillow. With dimensions of 60 X 24 X 7 inches (that’s length, width and diameter, in that order), this size could mean bigger capacity. 100% Satisfaction Guaranteed: PharMeDoc and its dealers have an offer to replace ordered products with issues upon purchase, by this offer; they are willing to send customers with a new one, no questions ask. That is fair enough. Bulky, not suitable for small beds: Due to its large size, this body pillow may overcrowd a small bed if husband and wife are to sleep together. However, it could fit well in a king-size bed even if both are tall and with bigger frame. No Spare Zippered Cover: The zippered cover that comes with the package is only one, you could order spare through your dealer. The part number can be seen at the accompanying users’ manual. Although the PharMeDoc Total Body Pillow is ideal for pregnant women, its use is not limited to them. Anyone could experience the great advantage of this pregnancy pillow, whether the person has small or large frame. The ergonomically designed pillow is also proven chemically safe for both mom and child even if the baby is still in her womb. The mother is not at risk of inhaling toxic chemical within the pillow. Furthermore, the full-body coverage of sleepers is just terrific for its therapeutic effects on the body and mind.